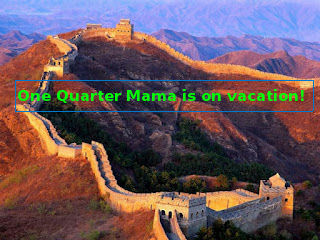 One Quarter Mama: On Vacation! Like I mentioned before, I'm taking off without the hubby and child. I'm heading to China, Japan and South Korea and away for the next two weeks, so don't expect too much from me. I do have one or two things ready to auto post and if I manage to get enough internet access, maybe you'll get pictures, but nothing major until I get back.